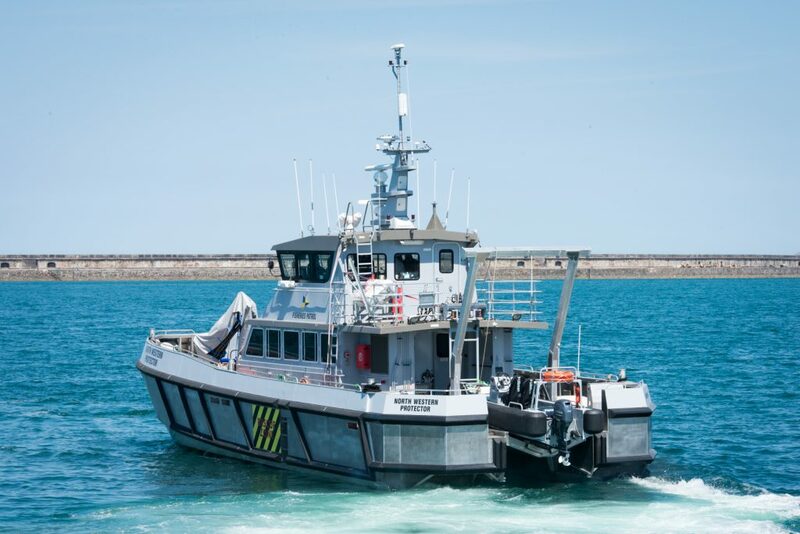 Holyhead Marine have completed the conversion of a 21m Wind Farm Service Vessel into a Fisheries Patrol Boat for the North Western Inshore Fisheries and Conservation Authority (NWIFCA) who are based in Carnforth and operate out of Whitehaven. The Authority required the conversion of an existing craft into a dedicated fisheries patrol boat with the capacity to carry out scientific sampling routines and be able to deploy a daughter boat for boarding activities. Holyhead Marine produced a proposal based on the conversion of the WFSV Cemaes Bay which is a 20m aluminium catamaran which was owned by their sister company Turbine Transfers. Strip out of passenger accommodation and installation of 2 two berth cabins, toilet and shower compartment, galley, mess area and laboratory. Installation of spiral stair case between wheelhouse and accommodation. Construction of hydraulically operated RHIB recovery ramp. Provision of a 5.3m daughter RHIB. An important feature the Authority required was the ability to launch a daughter RHIB. Working with Naval Architects from Amgram Ltd a scheme was developed to integrate a hydraulically operated RHIB ramp between the two hulls to accommodate a custom designed 5.3m aluminium RHIB. The RHIB is fitted with a 70bhp Yamaha outboard and is certified to the MCA workboat code as a Cat 3 craft. The Patrol Boat with daughter craft was delivered to Whitehaven on 5th July and has been named the North Western Protector.